First, here is a prime number whose binary representation is a T-Rex. 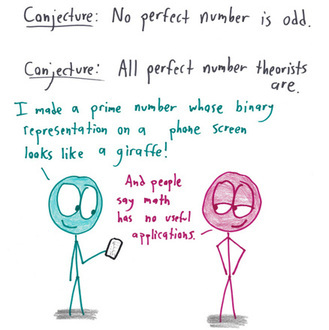 Math with bad drawings asked for a prime number whose binary representation is a giraffe. This lead to discussion on Math.reddit and Hacker news which led to finding such a prime number. You can see the binary representation on reddit. As Nathaniel Borenstein said It should be noted that no ethically-trained software engineer would ever consent to write a DestroyBaghdad procedure. Basic professional ethics would instead require him to write a DestroyCity procedure, to which Baghdad could be given as a parameter. So the obvious next step is to generalize this is to program which can take an image and find a primary number whose binary representation is the image. The image data is converted to monochrome and pixels darker (lower) than a threshold are converted 1, rest pixels are zero. We then start incrementing the number until we get a prime. The primality is tested using the Miller Rabin test. When such a number is found the number is converted to its binary representation, and displayed in a square grid. Thank you for reading the Agiliq blog. This article was written by shabda on Jan 21, 2018 in python , fun .